Belinda Trussell and Tattoo 15. The first 38 riders in a field of 77 took to centreline in the main arena at Tryon on an oppressively humid day that alternated ruthless sunshine with torrential downbursts. Belinda Trussell and the handsome Tattoo 15, the 15-year-old Westfalian gelding she owns with her husband, Mark, were first up for Canada this morning, riding in front of a fairly sparse crowd. The pair performed a calm and responsive test with nice changes and big extensions, although he was a little stingy with the piaffes. Their score of 68.634% parked them in 16th place at the end of the first day of grand prix competition that would count toward team medals and individual qualification for the freestyle. The strategy worked. “He was really, really good. The first day when he saw the World Equestrian Games signs in the ring he slammed on the brakes and went, ‘WHAT IS THAT! ?’ Today he didn’t look at a thing ‒ I am so proud of him. With the first half of the Grand Prix field finished, there is not a lot of leeway among the top teams, with Germany, Sweden, the USA and Great Britain crowding the top of the leaderboard, which is led individually by Germany’s Jessica von Bredow-Werndl with TSF Dalera BB (76.677%). 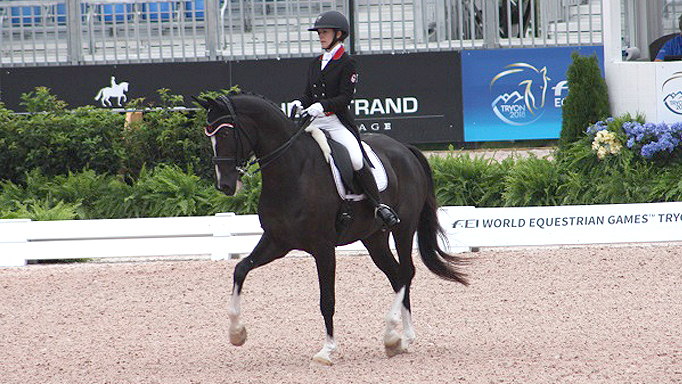 Team Canada is currently in 9th place, with some of the powerhouses of the sport including Laura Graves and Verdades, Edward Gal with Glock’s Zonik N.O.P., Isabell Werth and Bella Rose and Charlotte Dujardin with her new superstar, Mount St John Freestyle, to ride tomorrow.